Chinese medicine does not have a single explanation of the autoimmune pathology as obviously ancient Chinese medicine could not have such a view of the immune system. One can of course use a Chinese identification of patterns for each of these diseases and treat them successfully, but that does not really explain the autoimmune pathology or whether there is a common thread in the treatment of these diseases. For example, we can treat Hashimoto Thyroiditis successfully without any reference to it being an autoimmune disease. However, is there a single, underlying pathology in all autoimmune diseases and a common thread in the their treatment? From a Chinese medicine perspective, it is clear to me that we need to treat each autoimmune disease individually according to its pathology, aetiology, patterns irrespective of the fact that is an autoimmune disease. However, should we go a step further? Is there an underlying common treatment to all autoimmune diseases? The present article will endeavour to answer these questions. An autoimmune disorder is a condition that occurs when the immune system mistakenly attacks and destroys healthy body tissue perceiving it to be “non-self”. 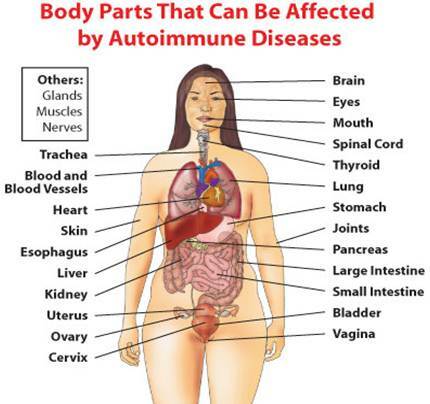 There are more than 80 different types of autoimmune disorders. Normally the immune system’s white blood cells help protect the body from antigens such as bacteria, viruses, toxins, cancer cells, and blood or tissues from another person or species. The immune system produces antibodies that destroy these harmful substances. In patients with an autoimmune disorder, the immune system perceives the body’s own tissues as antigens and attacks them. The result is an immune response that destroys normal body tissues. This response is a hypersensitivity reaction similar to the response in allergic conditions. In allergies, the immune system reacts to an outside substance that it normally would ignore. With autoimmune disorders, the immune system reacts to normal body tissues that it would normally ignore. What causes the immune system to no longer tell the difference between healthy body tissues and antigens is unknown. One theory is that some microorganisms (such as bacteria or viruses) or drugs may trigger some of these changes, especially in people who have genes that make them more likely to get autoimmune disorders. The possibility that microorganisms might trigger the pathology of auto-immunity is interesting because I believe that Latent Heat is often at the root of autoimmune diseases. Moreover, in my view, immunizations have a lot to do with the development of Latent Heat. - An autoimmune disorder may affect one or more organ or tissue types. From a Chinese perspective these three symptoms could be symptoms of Yin Fire or Latent Heat. Before discussing the possible interpretation of autoimmune diseases from the Chinese perspective, I would like to discuss the Chinese medicine correspondent of the immune system or, to put it differently, what parts of Chinese Vital Substances and functions influence the immune system. It would be easy to identify the function of the immune system as a Yang function (protection, immune cells constantly moving and hunting for antigens) but it would be wrong. The whole humoral part of the immune system relies on Blood and Yin. It is a very common misconception to attribute the immune response to Wei Qi which is natural since it is indeed the “protective” or “defensive” Qi that protects from exterior pathogenic factors. The following is the Chinese ideogram for "Wei". These two parts together form the character xing 行 which means "to move" (and it also the character for "Element" as in the "5 Elements". The modern, simplified character for "wei" 卫 does not mean anything. Chapter 18 of the Ling Shu says: “Ying Qi comes from the Middle Burner; Wei Qi comes from the Lower Burner.” This may come as a surprise to some as we are used to think of the Wei Qi being associated with the Lungs and therefore the Upper Burner, which it is. However, it is said that the Wei Qi comes from the Lower Burner because it is associated with Kidney-Yang. Of course, it is also true that the Wei Qi is diffused in the Upper Burner by the Lungs, but its origin is in the Lower Burner. Zhang Yuan Su (ca. 1151-1234) in the Yi Yuan “Origin of Medicine” says very clearly that the Wei Qi comes from the Lower Burner and the context can leave no doubt because he lists the three Burners, from Upper to Middle to Lower and therefore the third one (for the Wei Qi) could not but be the Lower Burner. Ying Qi is Yin, Wei Qi is Yang. We are used to think of Ying Qi as the one corresponding to food, nutrition and that is why it is called “Nutritive Qi”. However, Wei Qi is also related to food and nutrition. 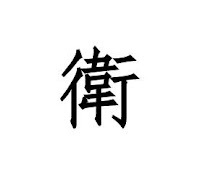 In fact the Su Wen says: “Wei Qi is the rough [han] Qi of water and grains.” The Su Wen uses the word “fierce, ferocious” [han 悍] that I translate as “rough”. Although stemming from the Lower Burner, Wei Qi influences the Upper Burner, the Lungs, the Exterior, the Cou Li space, the pores and sweating. Please note that the statement here that the Wei Qi exits in the Upper Burner is not in contradiction with the earlier one (Zhang Yuan Su) that stated that the Wei Qi comes from the Lower Burner. Wei Qi originates from the Lower Burner but it exits in the Upper Burner where it is controlled by the diffusing of Lung-Qi. Wei Qi goes to the Upper Burner and the Lungs “diffuses” it like an aerosol spray to the Upper Burner, the skin and the Cou Li space. Although we stress a lot the descending of Lung-Qi, the diffusing of Lung-Qi [xuan 宣] has an ascending movement. Acupuncture: LU-7 Lieque, L.I.-4 Hegu, BL-12 Fengmen. The “Exterior” is the space of the body that is outside the Zangfu and also outside the Main channels. It is the space where the Luo channels are. The Luo channels are the channels through which external pathogenic factors penetrate the body and the Wei Qi flows in the Luo channels performing its function of protection from external pathogenic factors. Acupuncture: LU-7 Lieque, L.I.-4 Hegu, BL-13 Feishu. The term Cou Li is difficult to translate. Cou means “cavity” while Li means “texture” as in the texture or grain of wood. Although Cou refers to any cavity of the body, some large, some small, the term Cou Li is usually used (although not strictly correct) to indicate the space between the skin and muscles. This is not literally and anatomically the space between skin and muscles but it must be interpreted energetically as a superficial space of the body, actually, apart from the skin itself, the most superficial. This is the space where the smaller and more superficial Luo channels flow [sun mai and fu mai]. The Cou Li 腠 理 space is the space between skin and muscles. The Luo channels are more superficial than the Main channels and they run in all directions, horizontally rather than vertically. Amongst other spaces, they fill the Cou Li space, i.e. the space between skin and muscles. 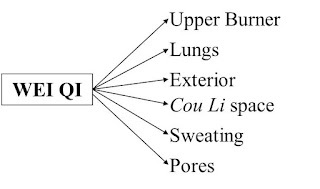 The Wei Qi influences the pores on the skin and therefore sweating. Sweat is in the Cou Li space. Th is space is regulated by the balance of Ying and Wei in it. When these are regulated, sweating is normal, i.e. normal sweating on exercise or when it is hot. The Cou Li space may be “too tight” which means the pores are closed and the person does not sweat on exercise or when it is hot. It also means that if this person gets an invasion of Wind, they will not sweat and one must use Ma Huang Tang Ephedra Decoction. 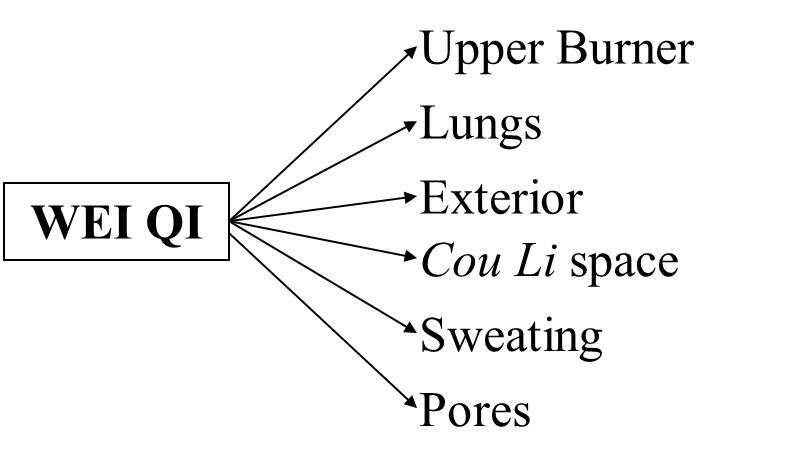 The Cou Li space may also be “too relaxed” in which case the pores are open and the person sweats spontaneously. It also means that if they get an invasion of Wind, there will be slight sweating, which is actually due to a deficiency of Ying Qi in the Cou Li space; one uses Gui Zhi Tang Ramulus Cinnamomi Decoction to regulate Ying and Wei in the Cou Li space. Ying Qi, the “nutritive” Qi is inseparable from Wei Qi. Although the two are always contrasted with each other, they are actually closely connected. The Wei Qi could not exist without Ying Qi. Ying Qi also keeps the Cou Li space “consolidated”; if the Cou Li space is not "consolidated" it is prone to invasions of Wind. If the Ying Qi is weak in this space, there is slight sweating during an invasion of Wind. Acupuncture: ST-36 Zusanli, Ren-12 Zhongwan, BL-20 Pishu, BL-21 Weishu. The Su Wen relates resistance to disease to Blood in many passages. “When the Qi of Blood is not harmonized, 100 diseases can arise.” Blood influences resistance to disease also due to its relationship with Ying Qi. The point BL-11 Dashu is the point of the Upper Sea of Blood of the Chong Mai. I use it with direct moxa, also to stimulate resistance to disease and to external pathogenic factors. Acupuncture: BL-11 Dashu, BL-17 Geshu (with direct moxa), Ren-4 Guanyuan, KI-3 Taixi, SP-6 Sanyinjiao, ST-36 Zusanli. The Kidneys play a big role in the immune system and resistance to disease. First of all, Kidney-Yang is the root of the Wei Qi which stems from the Lower Burner. Resistance to disease from a Chinese perspective depends on Qi and Qi is movement and movement is Yang. Kidney-Yang is the root of the Yang of the whole body. If we think of the B cells, T cells, macrophages, neutrophils etc, and how they move in the blood stream and the cells we get an idea of the need for Yang, i.e. movement (although the medium where it all happens is blood which is Yin). If we consider that the B cells produce highly specific antibodies at a rate of as many as 2000 molecules per second for four to five days, we get a very good idea of why it is a Yang process. The Kidneys play a role in the immune system also due to Yuan Qi and bone marrow which will be discussed separately. Acupuncture: BL-23 Shenshu, Ren-4 Guanyuan. Bone marrow depends on the Kidneys, more Yin than Yang. Jing is the organic foundation for the production of Marrow. “Marrow” (sui 髓) does not correspond to bone marrow of Western Medicine. 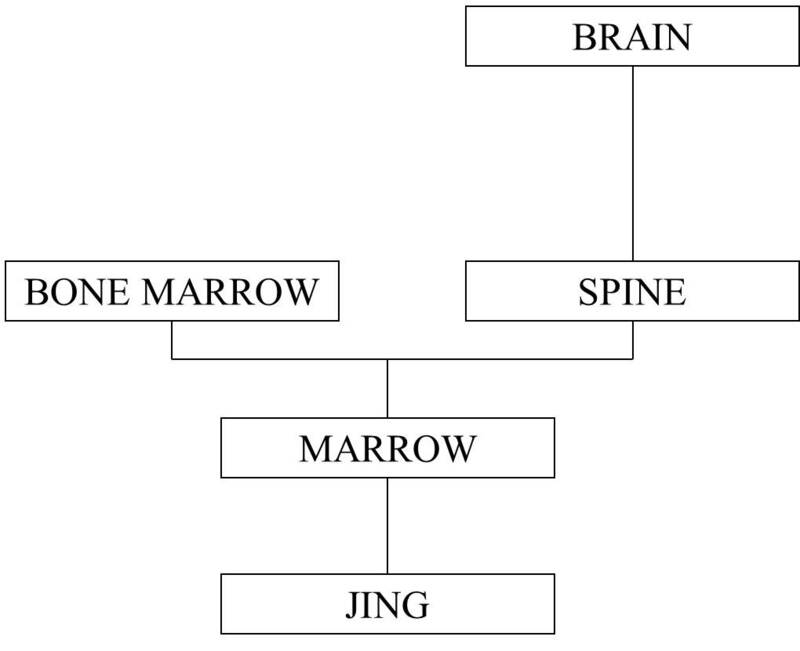 “Marrow” in Chinese Medicine is a substance which is the common matrix of bones, bone marrow, brain and spinal cord. This statement is interesting in its reference to a form of “fat” formed by food and drink which goes to form bone-marrow and the spinal cord and brain. 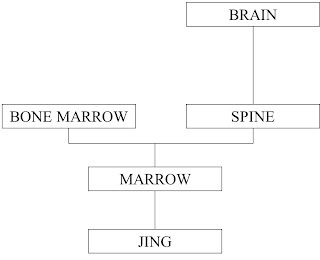 Therefore the bone-marrow, spinal cord and brain (all manifestations of “Marrow”) are a dense, material type of Qi which the Ling Shu calls “Fat”. Another interesting aspect of the above statement is the reference to the Marrow flowing to the thighs: therefore the ancient Chinese seem to have grasped the fact that long bones contain bone-marrow. It seems remarkable that the Chinese account of the blood-forming function of bone marrow, so similar to that given by Western physiology, was formulated during the Qing dynasty before the introduction of Western medicine into China. Lin Pei Qin, a doctor of the Qing dynasty, formulated the theory that ‘Liver and Kidneys have the same source’ and that Blood is transformed from Kidney Jing. The connection between bone marrow and Blood is a primordial understanding of the role of bone marrow in the immune system since both B cells and T cells derive from bone marrow. Acupuncture: BL-11 Dashu, G.B.-39 Xuanzhong, BL-17 Geshu, BL-23 Shenshu. Yuan Qi can be seen as the dynamic motive force that arouses and moves the functional activity of all the organs. It does so because, like Jing, it is the foundation of vitality and stamina. As a form of Qi, it circulates all over the body, in the channels. It could be said to be the link between Jing, which is more fluid-like and related to slow, long-term cycles and changes, and the day-to-day Qi, which is Qi-like and is related to short-term cycles and changes. Yuan Qi also facilitates the transformation of Gu Qi into Blood in the Heart. This is another way in which the Kidneys participate in the production of Blood. Chapter 8 of the Nan Jing: "Sometimes the Cun Kou is normal and yet the patient dies. Why is that? The pulses of the 12 channels all originate from the Yuan Qi. This Yuan Qi is the root of the 12 channels, it is the Motive Force (Dong Qi 动 气) between the Kidneys, the root of the 5 Zang and 6 Fu and of the 12 channels, the gate of breathing and the origin of the Triple Burner. It is the spirit that guards against pathogenic factors (or evil influences). Such Qi is the root of humankind; if the root is cut stalks and leaves wither. When the Cun Kou is normal but the patient dies, it means that the Yuan Qi has been cut off internally." This chapter establishes some very important principles. First, it talks about the Yuan Qi 原 气: this is essentially the meaning of the expression “Sheng Qi Zhi Yuan” which can be translated as the “Origin of Life’s Qi” or “Origin that generates Qi”. 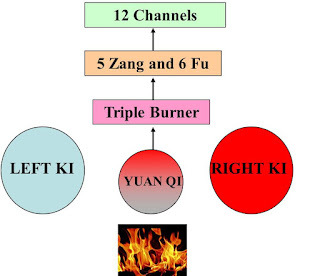 It says that Yuan Qi is between the Kidneys (like the Ming Men) and that it is the root of the 12 channels, the Triple Burner and the 5 Zang and 6 Fu. This chapter also establishes the idea that the Yuan Qi (and therefore the Kidneys) is the root of the 5 Zang and 6 Fu, of the 12 channels and of the Triple Burner. Secondly, this passage establishes the principle that the Yuan Qi (and therefore the Kidneys) play a role in the resistance to pathogenic factors. Interestingly, it calls the Yuan Qi the Shen that protect from pathogenic factors (or evils). This is of huge clinical significance because it means that our resistance to pathogenic factors depends not only on the Wei Qi and therefore Lungs but also on the Kidneys and the Yuan Qi (and also Jing due to the extraordinary vessels). In any case, Wei Qi stems from the Lower Burner. This is of clinical significance not only in resistance to pathogenic factors but also in the pathology of allergic asthma and allergic rhinitis, the root of which is also in the Kidneys, the Jing and the Yuan Qi. As we shall see, a deficiency of the Kidneys also plays a role in the formation of Latent Heat and a deficiency of Yuan Qi plays a role in the formation of Yin Fire which are often at the base of auto-immune disorders. The “three Qi” mentioned here are the Yuan Qi, Ying Qi and Wei Qi of Lower, Middle and Upper Burner respectively. Yuan Qi is part of a triad of types of Qi, all which play a role in resistance to disease in the three Burners: Yuan Qi in the Lower, Ying Qi in the Middle and Wei Qi in the Upper Burner. Acupuncture: Ren-4 Guanyuan, BL-23 Shenshu, Du-4 Mingmen. We are used to think of Jing as the precious Essence that we inherit from the parents, that determines our constitution and that resides in the Lower Dan Tian. When described like that, the Jing sounds like an inert essence but, in reality, Jing circulates in the channels and plays an important role in resistance to disease. It circulates in the channels through the extraordinary vessels. 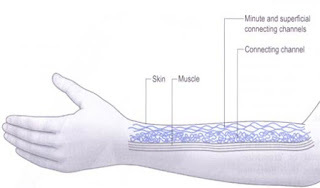 The influence of the Extraordinary Vessels on the space between skin and muscles implies their important role in protection from pathogenic factors. As the Extraordinary Vessels circulate the Kidney-Jing, this means that Jing plays a role in many physiological functions and, in particular, in the protection against external pathogenic factors. A deficiency of Jing plays a role in the formation of Latent Heat and, in my opinion, in the aetiology of allergic diseases such as allergic asthma, allergic rhinitis and atopic eczema and of auto-immune disorders. Indeed, it is in my opinion the aetiology of atopy itself. The "Study of the Eight Extraordinary Vessels" by Li Shi Zhen says: "...when the Qi of the channels overflows, it flows into the extraordinary vessels where it is turned into irrigation, warming the organs internally and irrigating the space between skin and muscles externally." The Qi of the Extraordinary Vessels “irrigates” the space between the skin and muscles where Defensive Qi circulates to prevent invasion of pathogenic factors. Because all the Extraordinary Vessels derive directly or indirectly from the Kidneys, they play an important role in the defence against exterior pathogenic factors. - Du Mai: SI-3 Houxi with BL-62 Shenmai, BL-23 Shenshu, Du-4 Mingmen, Du-14 Dazhui. - Ren Mai: LU-7 Lieque with KI-6 Zhaohai, Ren-4 Guanyuan. Finally, the Stomach and Spleen also play a role in the resistance to disease. This is quite obvious since they are the origin of nutrition and of Gu Qi which is the basis for both Ying and Wei Qi. The Stomach and Spleen play a particularly important role in the immune system of children. Dr Shen used to say that there are only two aetiological factors in children: external Wind and nutrition (Stomach and Spleen). He then added that, the younger the child, the more there is only one aetiological factor and that is the Stomach and Spleen because they determine resistance to external pathogenic factors. Acupuncture: Ren-12 Zhongwan, ST-36 Zusanli, BL-20 Pishu, BL-21 Weishu. 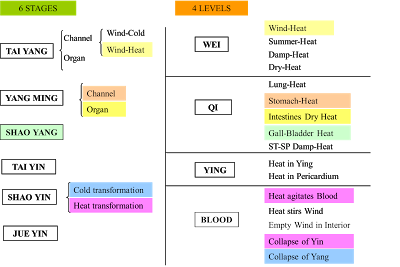 The 6 Stages were developed by Zhang Zhong Jing in his book "A Discussion of Diseases from Cold Injury" (Shang Han Lun, ca. AD 220) while the 4 Levels were developed much later by Ye Tian Shi in his book "A Discussion of Warm Diseases" (Wen Bing Lun, 1742). The patterns of both of these theories describe the progression of fevers from external invasions of Wind. Although these two theories are often contrasted to each other, they have many points in common as illustrated in the diagram below. The patterns in this diagram are colour-coded to show the connections between the patterns of the 6 Stages with those of the 4 Levels. 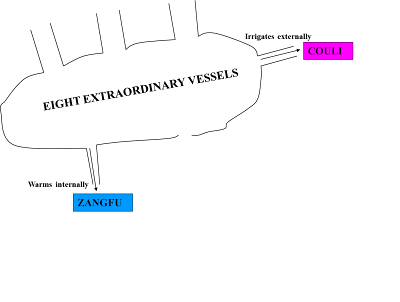 In particular, there is a strong connection between the Yang Ming Stage and the Qi Level and many of the prescriptions used by Ye Tian Shi for the Qi Level are the same as those for the Yang Ming Stage in the Shang Han Lun. I have been thinking about these ancient patterns and it occurred to me that they could be seen as a picture of the immune system and this idea is illustrated in the diagram below. 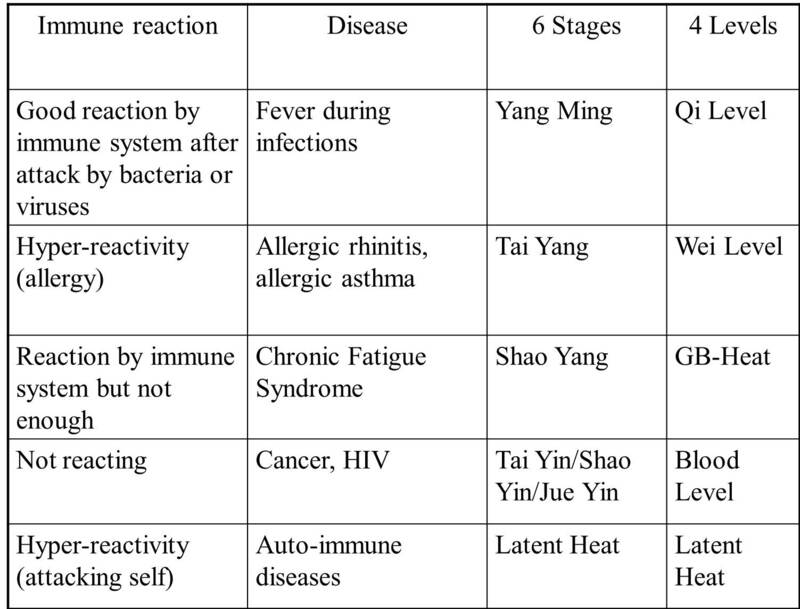 For example, if we fall ill with a fever of external origin (we can think of influenza, for example) and, after the initial stage, we develop a higher fever, it indicates that the body is reacting and fighting the pathogenic factor: this is a good state of the immune system and it corresponds to the Qi Level of the 4 Levels or the Yang Ming stage of the 6 Stages. 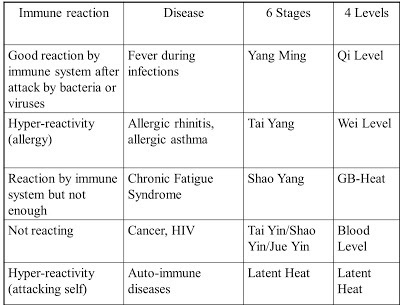 Allergy, such as in allergic asthma and allergic rhinitis, represents a hyper-activity of the immune system that is reacting to allergens to which it should not: this could be represented by the Wei Level pattern in the 4 Levels or the Tai Yang Stage in the 6 Stages. In chronic fatigue syndrome, the immune system is reacting to a viral infection, but not enough, so that the disease has a chronic course: this corresponds to the Gall-Bladder-Heat pattern of the 4 Levels or the Shao Yang Stage of the 6 Stages. If our immune system is greatly debilitated, it may succumb to cancer and this corresponds to the Blood Level of the 4 Levels or the three Yin Stages of the 6 Stages. In autoimmune diseases, the immune system has a deep dysfunction that leads it to attack the cells of the body, mistaking them for "other": this often (but not always) corresponds to Latent Heat. In my view, the presence of an auto-immune dysfunction of the immune system indicates an aetiological factor that is at a deep energetic level and that is different from normal exterior pathogenic factors. It indicates a more insidious form of pathogenic factor. The immune dysfunction also indicates a pathology of the Yin aspects of the immune system, i.e. Blood, bone marrow, Kidneys. However, auto-immune diseases are so many and so disparate that it is impossible to prescribe a blanket treatment method for them. For example, the pathology of Hashimoto’s thyroiditis and MS are so different that they really have very little in common. The only thing they might have in common is the aetiology. In many, but not all, auto-immune diseases the aetiology is Latent Heat. This is the case especially when there are symptoms of Heat, with lassitude and possibly fever, they have something in common in their pathology. In other cases of autoimmune diseases, the main pathology may also be Yin Fire. Also, if we know we are dealing with an auto-immune disease, it gives us an important pointer from the point of view of prognosis. However, there is an interesting common feature of some auto-immune diseases and that is the pulse. I have noticed this especially in MS, RA, Hashimoto's thyroiditis and Crohn’s disease. The pulse is of the Leather [ge 革] quality, i.e. it is superficial and “stretched” like a drum but empty at the deep level: it feels hard on the outside but empty inside, like a drum. The Leather pulse indicates severe deficiency of Blood, Essence or Yin. It also indicates Qi floating upwards because it is not rooted by Blood. This would indicate that the root of these autoimmune diseases is a Kidney deficiency. - No Chinese theory obviously. - All diseases are very different and must be treated according to their specific pathology and patterns (e.g. MS and Hashimoto’s thyroiditis have nothing in common from Chinese perspective). - Being auto-immune affects ease (or difficulty) of treatment and prognosis. They are more difficult to treat. drum. This indicates a severe Kidney deficiency. - Must grasp aetiology, pathology and patterns of the disease ignoring its auto-immune nature. For _example, Sjogren’s Syndrome, Hashimoto thyroiditis, Crohn’s Disease, MS and RA have very little or _nothing in common in terms of pathology. 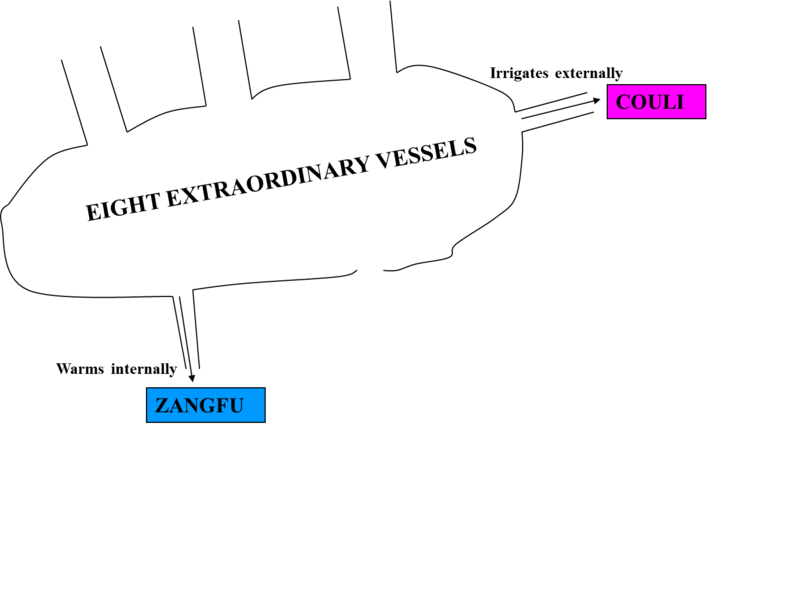 Kidney-Yin, Jing, Yuan Qi, Minister Fire. - Must treat inflammation with at least one or two anti-inflammatory herbs. - Check if there is Latent Heat or Yin Fire and treat them accordingly. As one can see, this list is so extensive that practically every formula we use will have some anti-inflammatory herb in it. I believe it is very important to use some anti-inflammatory herbs in the treatment of autoimmune diseases. I especially use Mu Dan Pi Cortex Moutan. It is worth also noting that the anti-inflammatory herbs are found in many different categories of herbs, not just those that clear Heat: thus having an anti-inflammatory effect does not necessarily involve clearing Heat from the Chinese perspective. Indeed, it is very interesting (and somewhat surprising) that even Fu Zi and Cao Wu (extremely hot herbs) are anti-inflammatory. The following is an online article from Harvard University about the effect of the Chinese herb Chang Shan Radix Dichroae febrifugae on autoimmune diseases. For roughly 2,000 years, Chinese herbalists have treated malaria using a root extract, commonly known as Tu Chang Shan, from a type of hydrangea that grows in Tibet and Nepal. More recent studies suggest that halofuginone, a compound derived from this extract’s bioactive ingredient, could be used to treat many autoimmune disorders as well. Now, researchers from the Harvard School of Dental Medicine have discovered the molecular secrets behind this herbal extract’s power. "This study is an exciting example of how solving the molecular mechanism of traditional herbal medicine can lead both to new insights into physiological regulation and to novel approaches to the treatment of disease,” said Tracy Keller, an instructor in Whitman’s lab and the first author on the paper. In 2009, Keller and colleagues reported that HF protects against harmful Th17 immune cells without affecting other beneficial immune cells. Recognized only since 2006, Th17 cells are “bad actors,” implicated in many autoimmune diseases such as inflammatory bowel disease, rheumatoid arthritis, multiple sclerosis, and psoriasis. The researchers found that minute doses of HF reduced multiple sclerosis in a mouse model. As such, it was one of a new arsenal of drugs that selectively inhibits autoimmune pathology without suppressing the immune system globally. Further analysis showed that HF was somehow turning on genes involved in a newly discovered pathway called the amino acid response pathway, or AAR. Scientists have only recently appreciated the role of the nutrient sensing-AAR pathway in immune regulation and metabolic signaling. There is also evidence that it extends life span and delays age-related inflammatory diseases in animal studies on caloric restriction. AAR lets cells know when they need to preserve resources. For example, when a cell senses a limited supply of amino acids for building proteins, AAR will block signals that promote inflammation because inflamed tissues require lots of protein. “Think about how during a power outage we conserve what little juice we have left on our devices, foregoing chats in favor of emergency calls,” said Whitman. “Cells use similar logic.”For the current study, the researchers investigated how HF activates the AAR pathway, looking at the most basic process that cells use to translate a gene’s DNA code into the amino acid chain that makes up a protein. Nevertheless, “[the] AAR pathway is clearly an interesting drug target, and halofuginone, in addition to its potential therapeutic uses, is a powerful tool for studying the AAR pathway,” said Whitman. 5. Chen JK, Chen TT, "Chinese Medical Herbology and Pharmacology", Art of Medicine Press, City of Industry, CA, 2001.